No one knows today how Gorm the Old, Queen Thyra and Harald Bluetooth looked or what they were like as people. However, over the course of time many suggestions have been made regarding this, of which some are more serious than others. The artists found the inspiration for the first pictures from their own time or the classical world, which was far removed from Viking Age Denmark. Since the 1800s archaeological finds have added a substantial amount of new knowledge about ways of life and dress in prehistoric times and we now have a much better impression of the possibilities 1000 years ago. The pictures sides of Harald Bluetooth’s rune stone from Professor Ole Worm’s famous work Monumenta Danica of 1643. The National Museum. 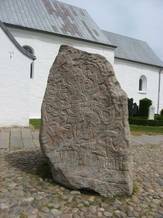 The human image on the large rune stone at Jelling was for a long time assumed to be a portrait of Harald Bluetooth. The rune stone and its inscription is described in a manuscript from 1607, Jydske Antiqviteter, put together by the learned landowner Anne Krabbe (1552-1618) of Stenalt in Djursland. 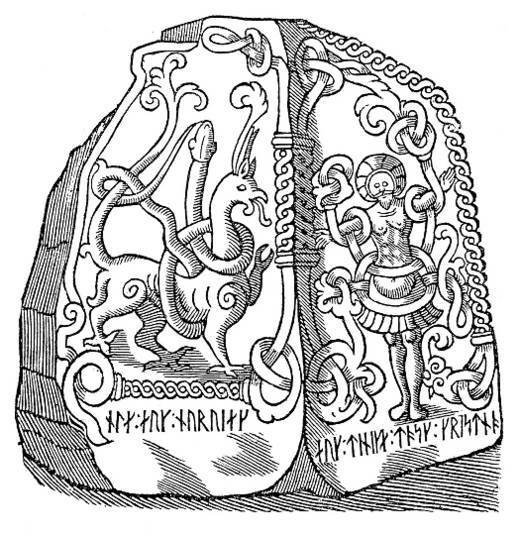 It is written that on the rune stone’s third side here is seen “King Harald himself is carved in his full breast armour with a pleated tunic over the armour, and under him: I believe in Christ”. Anne Krabbe was a diligent collector of documents and information about the past. However, she may not have seen the monuments in Jelling herself as the inscriptions upon the two rune stones are mixed together and described as if they both were written upon Harald’s rune stone. It was only at the beginning of the 19th century that it was finally established that the figure represents Christ and not King Harald. Harald Bluetooth’s rune stone. For a long time the Christ side was perceived to be a portrait of King Harald himself. Photo: Anne Pedersen.